We have always been learning, but I finally took the plunge where I feel like we’re actually homeschooling. By that I mean, I plan our days with intention, rather than just winging it all the time. It’s not that results can’t come from winging it, but there’s something steadfast and satiable when our rhythm of learning is more deliberate, at least, on my end as a facilitator of learning. Besides, I have accumulated a lot of materials in the last few years—when I don’t plan, materials and ideas are left alone, forgotten. And if I’m being absolutely honest, I tend to be lazy if I don’t have a plan for the day (especially when massively pregnant). If anything, homeschooling pushes me to improve myself, to stretch out of my comfort zone, and to explore all the things I want to do with my kids. It makes me feel brave. Play is everything. I have seen more come out of play than any other method. So most of our intentional learning is play-based. 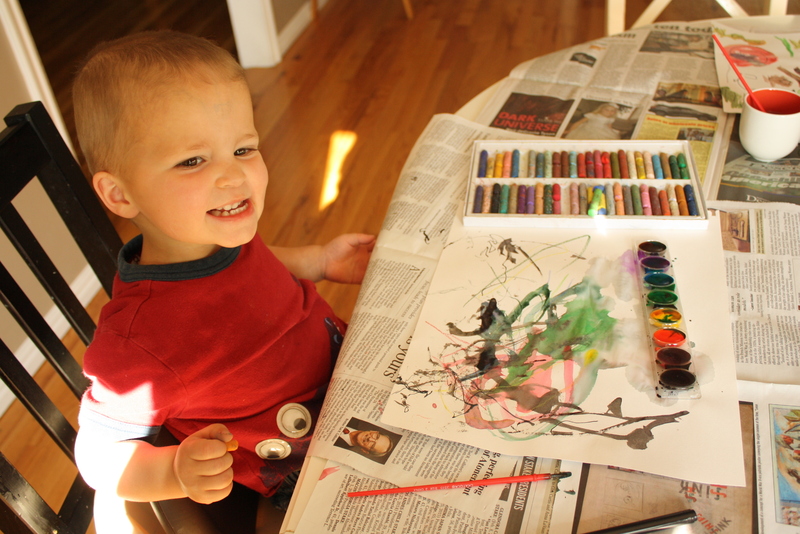 Unintentional learning is also play-based, obviously. Here is what we are working on right now. The issue is, he’s definitely interested in writing, but his lack of hand preference and his immature grip make me hesitate to give any proper instruction. Last week, if you asked me I would have said he was left-handed. Today, he was writing all day with his right hand. Typing this, I remember now how I need to return to tracing sandpaper letters, because those things aren’t an issue with that type of work. I tend to over-think these things. Anyway, so this past week we made playdough together. Then we practiced rolling a lot of playdough snakes and balls, doing some bilateral coordinative work. 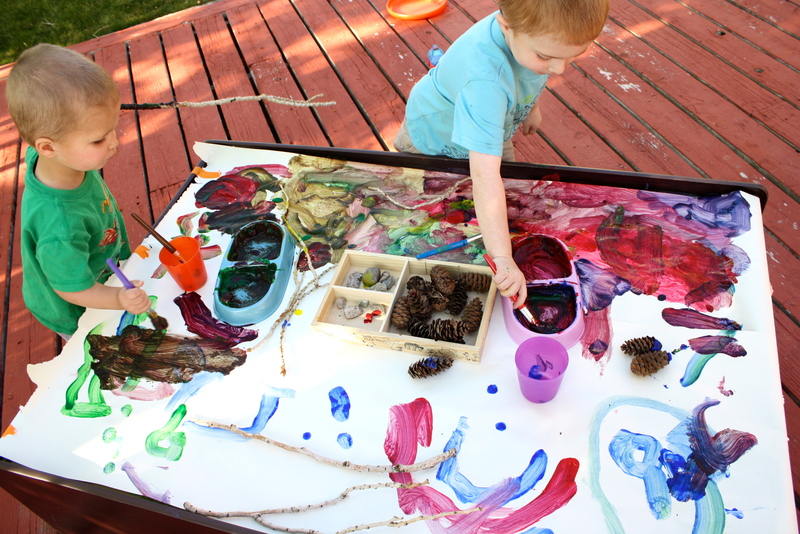 We also explored different art media and materials, both in and outdoors. There was some impromptu counter work, using sandpaper numbers and color chart blocks. 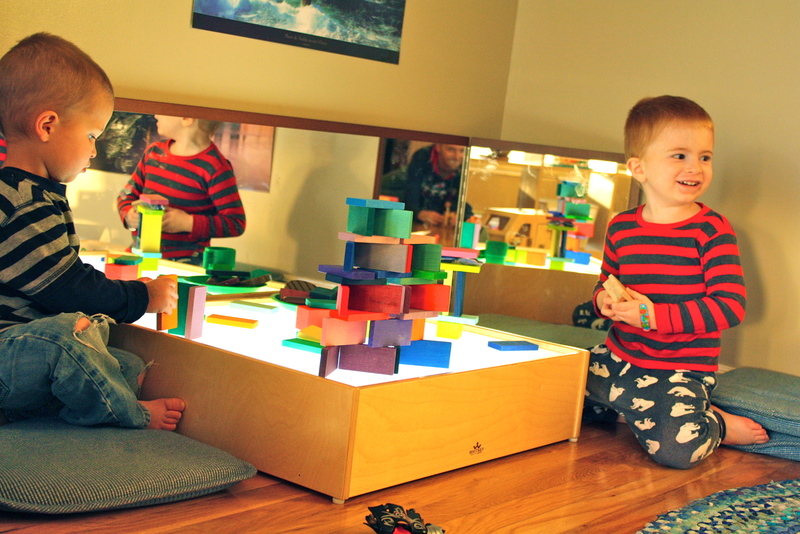 The boys began setting this up in the play room by themselves. 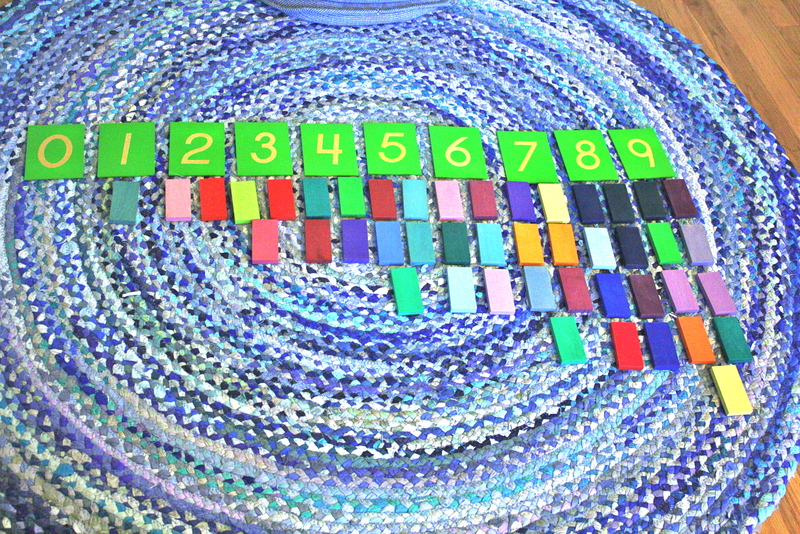 I stepped in to slide my finger down the middle to differentiate between odd and even numbers, which Charlie picked up on immediately—another testament to the beauty of Montessori work. I stayed up late a few nights to reorganize and purge our play room. I have yet to take a decent picture of the space, but already the room feels fresh and inviting. I removed a lot of the excess, and pared things down. The idea is to make the space ideal for block exploration, to bring to focus science, mathematics, art, geography, language, and physical development, primarily through block play. I prefer a more austere look to the room, to wheedle out distractions; however, I bought some posters of famous buildings to inspire; I printed and taped pictures to the walls of previous structures the boys had made; I scattered some books about the room for browsing. 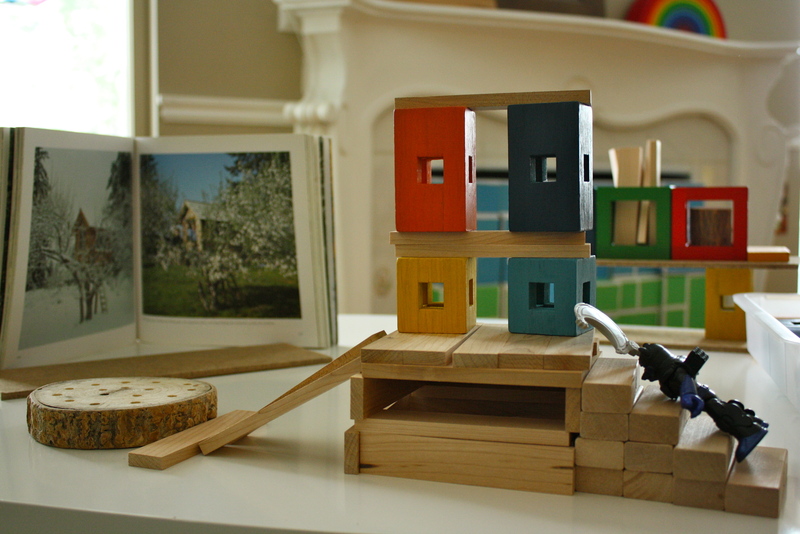 I have been reading up on block play, and I hope to save my pennies to buy a nice set of unit blocks soon. We already have a variety of blocks, but a set of unit blocks is necessary for this kind of work. 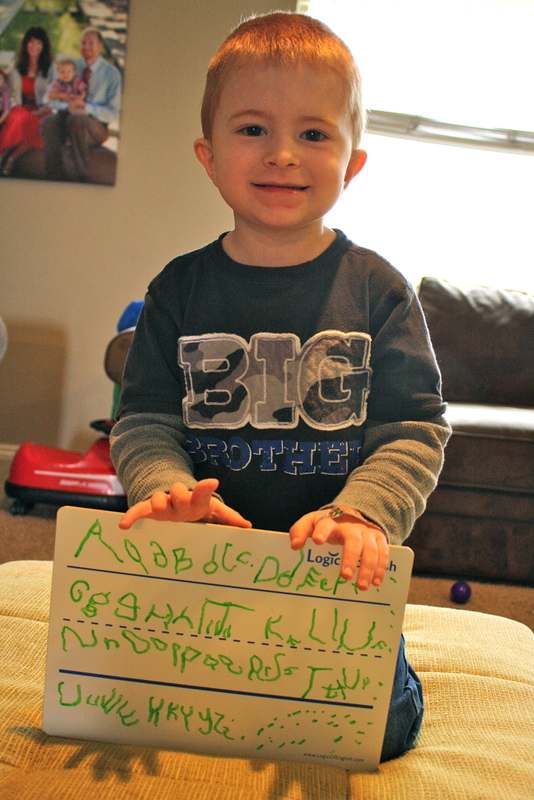 One goal we have with Charles, is to help him with his expressive language. He tends to be the strong silent type, it’s true, and there’s nothing wrong with that. Even so, at times he has difficulty communicating and expressing full thoughts verbally. 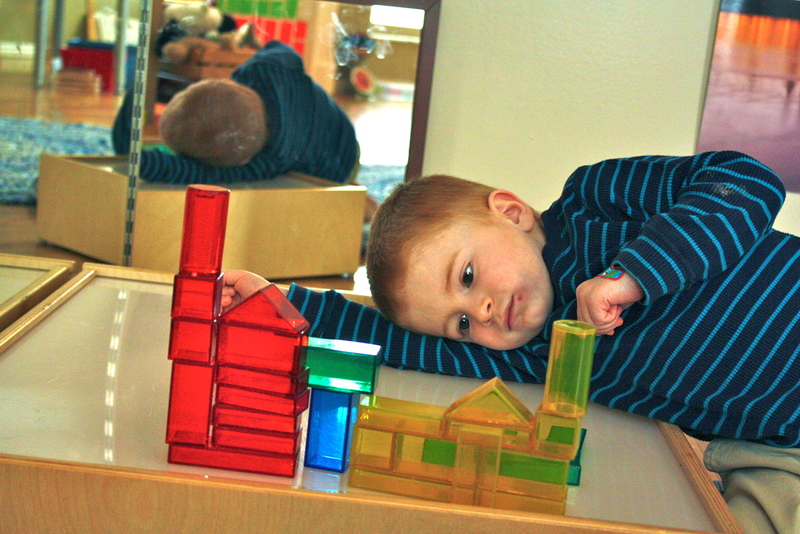 I’m hoping to encourage active dialogue about his block play, not only to help point out new discoveries, but also as a means to help his expressive language skills flourish. 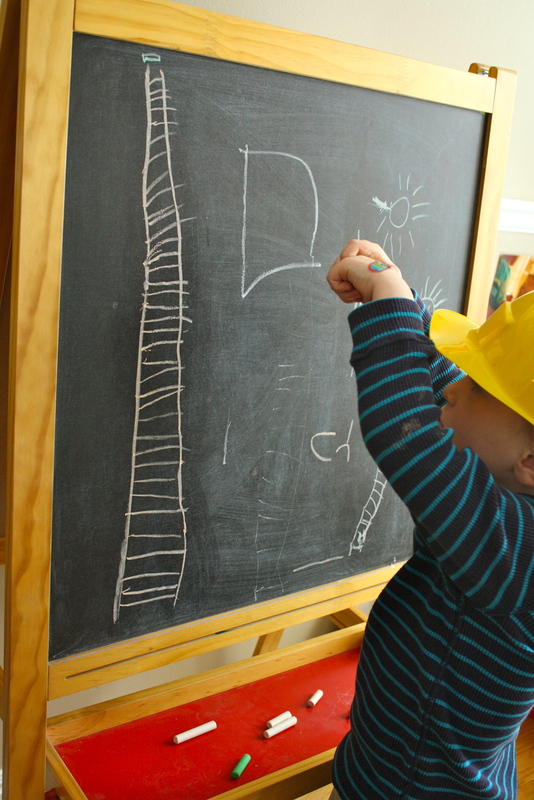 Charles describes his drawing: a ladder going up to his treehouse. 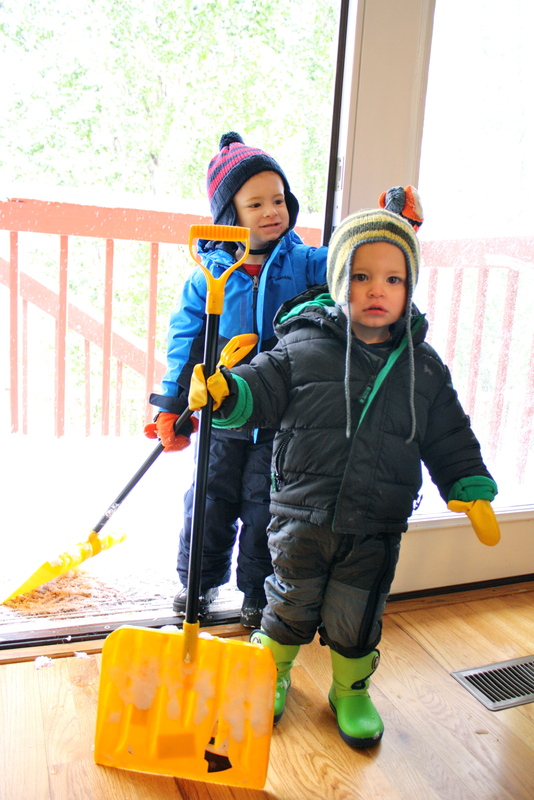 The boys also enjoyed a snow day, in the middle of April. Typical Spring weather around here. We’ve had a sparse winter, so it was nice to put those shovels to good use. Charles was ecstatic to build a snowman. And finally, we used those little espresso mugs I got for Christmas to drink some hot cocoa! Let’s be honest: watching a two year old waddle about in snow clothes doesn’t get old. Although getting him in and out of said snow clothes several times in one day gets old pretty fast. Waiting for Papa to launch a bean bag via catapult to knock down the tower.